It’s finally the weekend! We’re heading down to see our families in Jersey City and the Philly area again. I packed this floral shirred square neck top since it won’t show wrinkles easily when packed. I managed to pack both my husband and my clothes for the week into one travel sized suitcase although we always have a lot of extra bags for our laptops and other stuff. LOFT – Get 40% off almost everything plus get an extra 50-60% off sale styles (FYI. save an extra 60% off PLUS sale styles). Use code LOVEIT. Sale ends today 7/28 so I wonder what surprise they have in store for us tomorrow. Shop a few of my favorite sales picks linked to this post from my Insta Shop. FYI. There are lots of markdowns at LOFT Outlet online. Ann Taylor – Get an extra 50% off + an extra 10% off sale styles during The Semi Annual sale. They added new styles to the sale just the other day! Also get 40% off shoes and since no code is needed you can use THANKS10 for an extra $50 off $100+ valid only on full-price promotional items. Shop a few of my sales picks linked to this post from my Insta Shop. 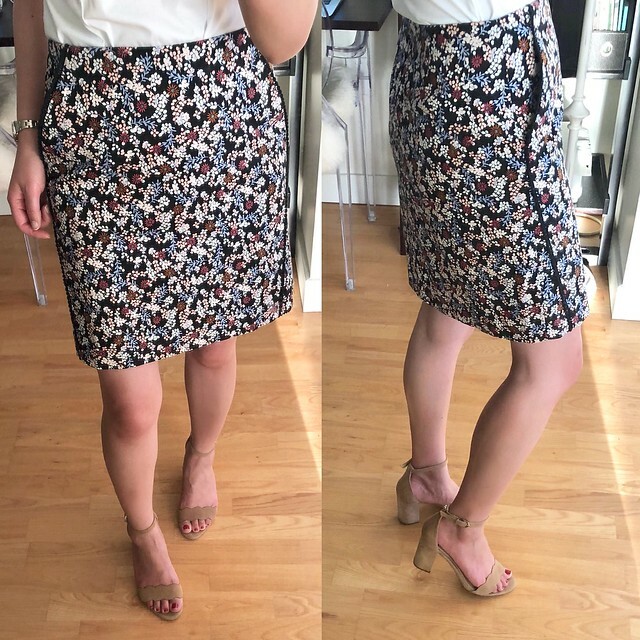 I meant to include some Ann Taylor reviews in this post but I ran out of time. Every single thing is also on sale at Ann Taylor Factory! Meanwhile please check out my latest post with Ann Taylor here. I love this pretty top and Sandy had tried it on when she was visiting for work. I took size XXSP but the arm holes and the chest run a bit narrow due to sizing down so I probably should have gone with my usual size XSP for comfort. 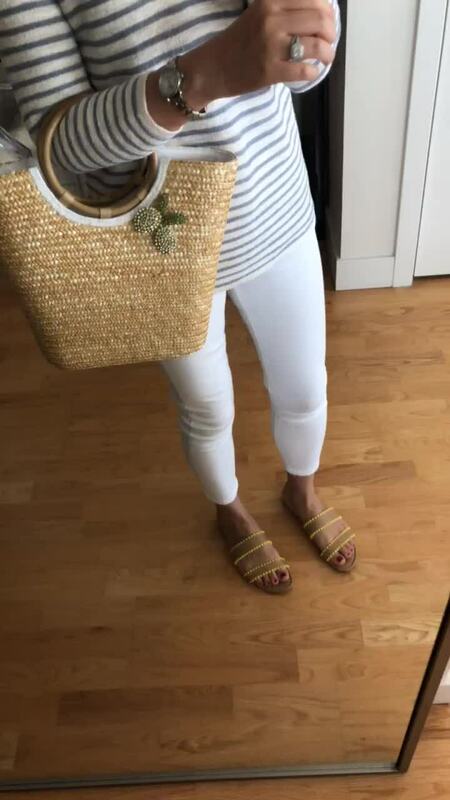 I originally bought this top in size XXS regular (review here, review of size XS regular here) but I gave it to a friend since the top was too long for me in regular missy. I recently reordered it in size XXSP for a better fit. The v-neck is slightly lower so you may want to layer with a cami for more coverage. 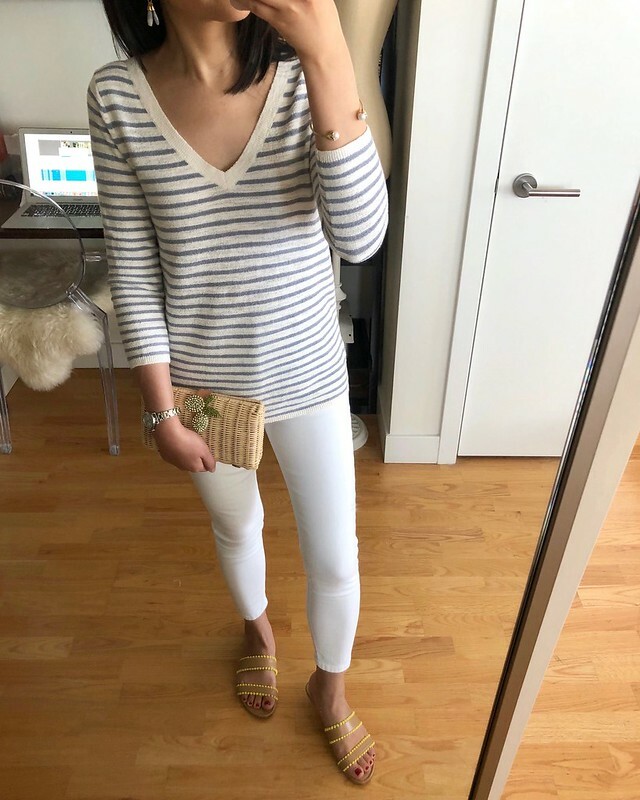 The v-neck of this sweater is more open and this outfit looks very similar to the outfit above this one so I returned it for now. I can’t recall if this sweater came in petites but I would have preferred a slightly shorter length. This style is also available in black and white stripes and a few solid colors. I love this jeweled lemon pin as a fun summertime accessory as seen in this post. It looks great pinned on my straw bags and my seersucker Newbury blazer (review here and here). The clasp was a bit loose on the one I got or maybe I was applying too much pressure trying to pin it on different things so I used some pliers to tighten it. 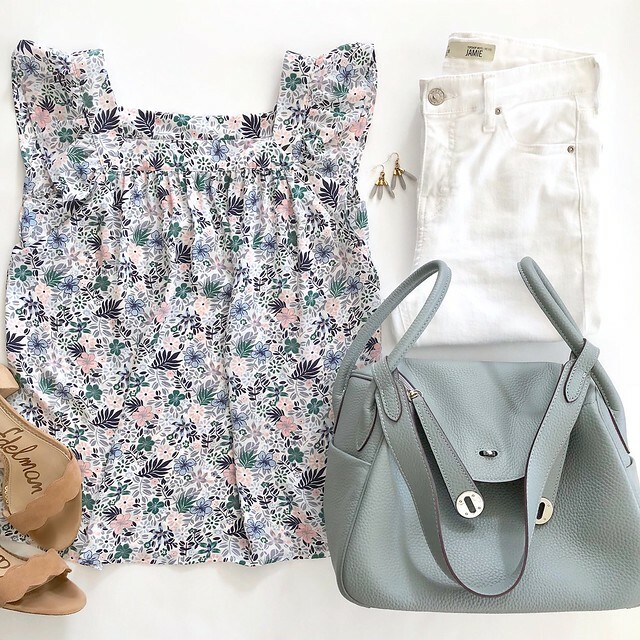 I stopped by the store on Friday but I didn’t see too many new arrivals out on the floor although I spotted this new floral ruffle flutter top (review below). 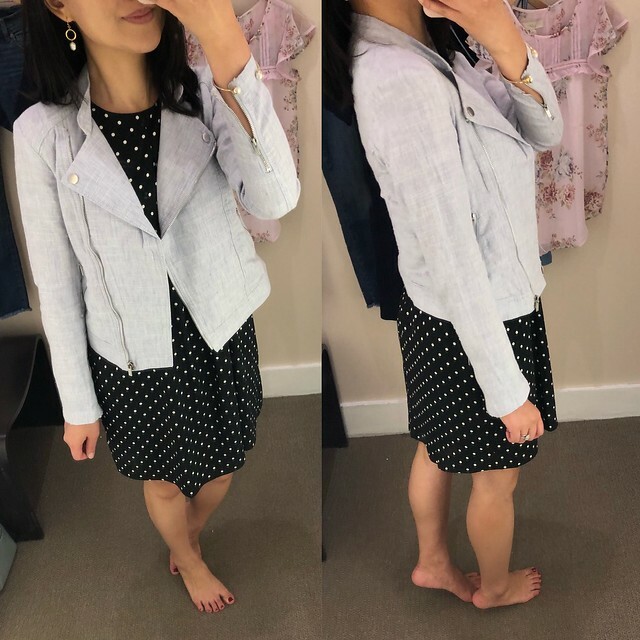 I received a try-on request for this jacket and I love how versatile it is! It’s 65% linen and 35% cotton so it’s the same composition as my beloved white linen cotton denim jacket (old review from 2015 here). Size XXS petite fit like size XS petite. The measurements of size XXSP are: 14.5″ shoulders, 34″ chest (with the jacket fully zipped), 32″ along the bottom hem, 22.5″ sleeve length. The jacket has functional pockets but they are very shallow so you can’t really put your hands inside. Update 8/4: The jacket washed well in the cold machine wash and air dried. 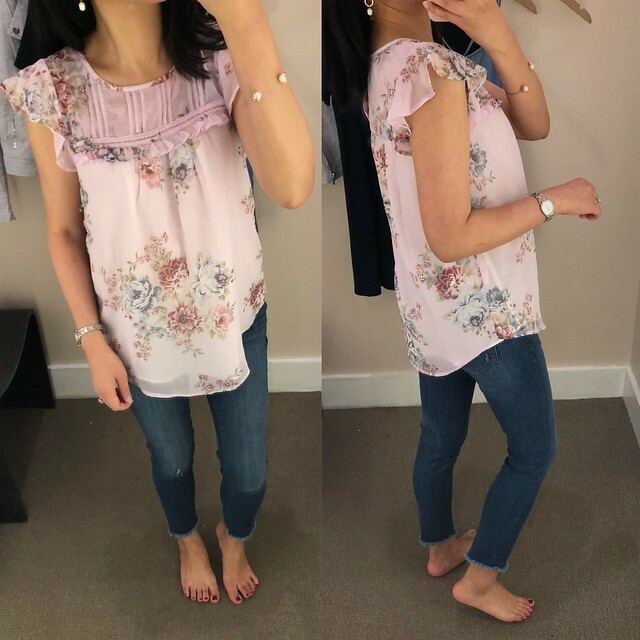 This pretty floral top was on my wish list so I was excited to find it to try on. It fits true to size and the colors are really pretty. It is fully lined so it’s not see through. The arm holes run smaller than usual for a regular missy size XS regular so some people may find it too tight especially if you’re not petite and small chested. Otherwise the length and fit is true to size. I would prefer this top in petites for a shorter length but my store didn’t have it out on the floor in petites yet. I also tried on size XS petite in this swing dress again since I was hoping the length would be longer but it was still very short. 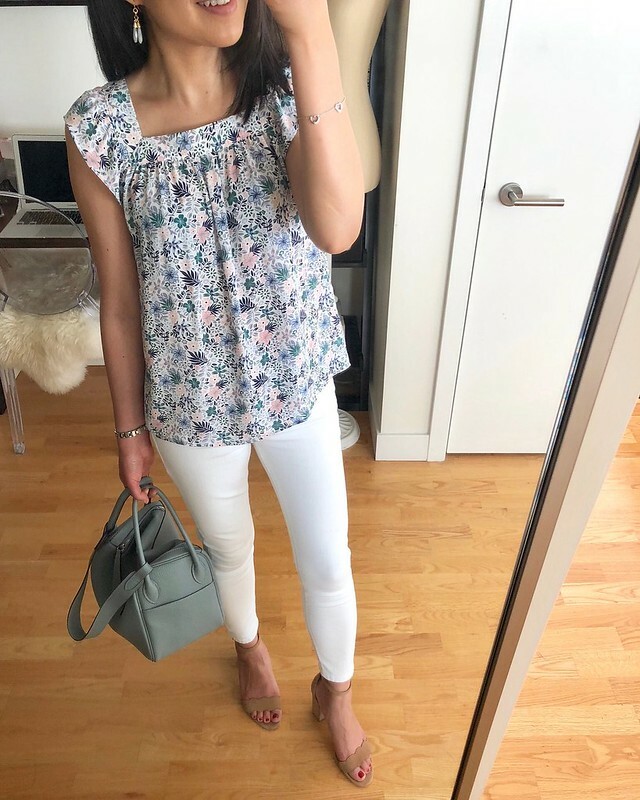 It did fit a lot better across my shoulders and chest so I didn’t have the pulling issue that I had with size XXS petite (review here). I will have to try this dress in the regular missy for the longer length to compare. I have to thank the recent LOFT sale for reminding me about this classic jumpsuit. It is short waisted as other reviewers noted but since I have a small chest size XXSP works for me. It has pockets and the back has a cute ruffle detail if you view the video clips I linked to. 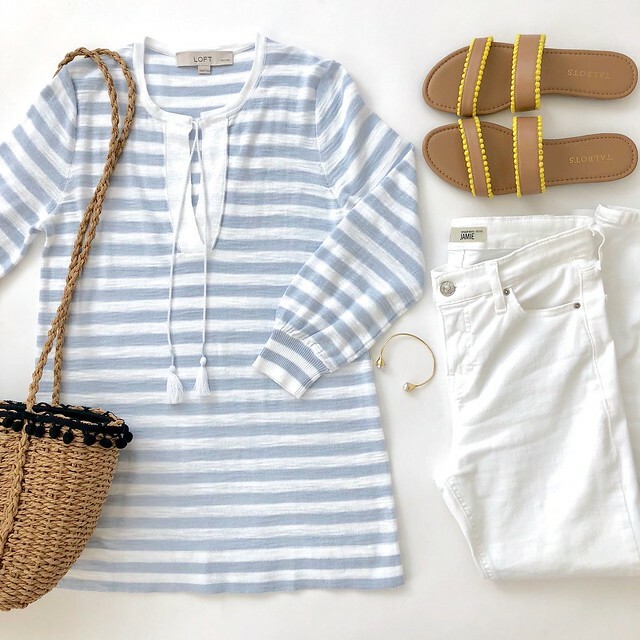 Size XXS petite measures: 29″ chest (measured pit to pit), 24″ elastic waist (unstretched), 18″ length for the top portion, 32.5″ length for the pants portion, 50.5″ total length. For reference I’m 5′ 2.5″ and currently 106.5 pounds. Update 8/4: The jumpsuit washed well on cold wash and air dried. The lace detail on this black romper is very pretty but the zipper in the back causes the material to billow out instead of laying flush against my back. 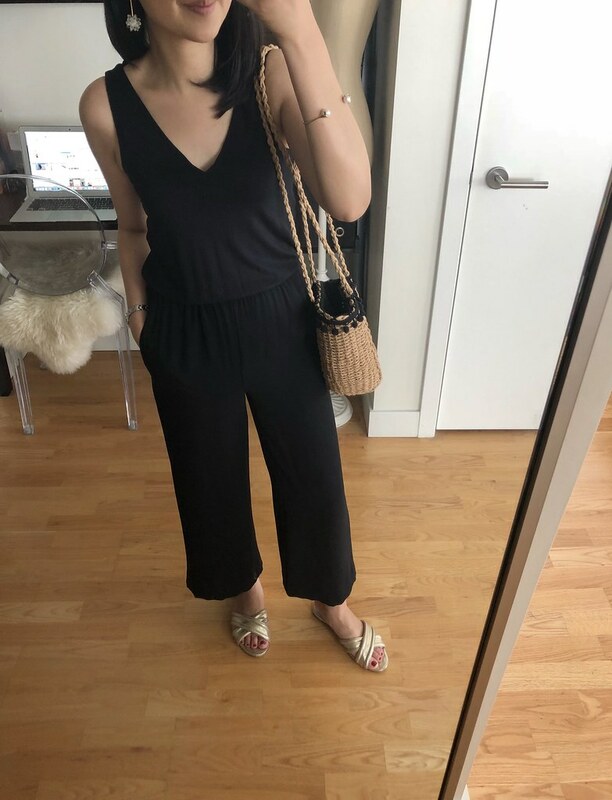 The jumpsuit runs bigger up top so it overwhelms my small chest (I take size 32A in petite bras) and there is too much material at the waist on me. The measurements of size XXS petite are: 36″ bust (measured pit to pit, 28″ elastic waist (unstretched), 17″ length top portion, 13″ length for the bottom portion, 30″ total length. If the romper didn’t work out for you then you might be interested in the lace trim pintucked shell instead. 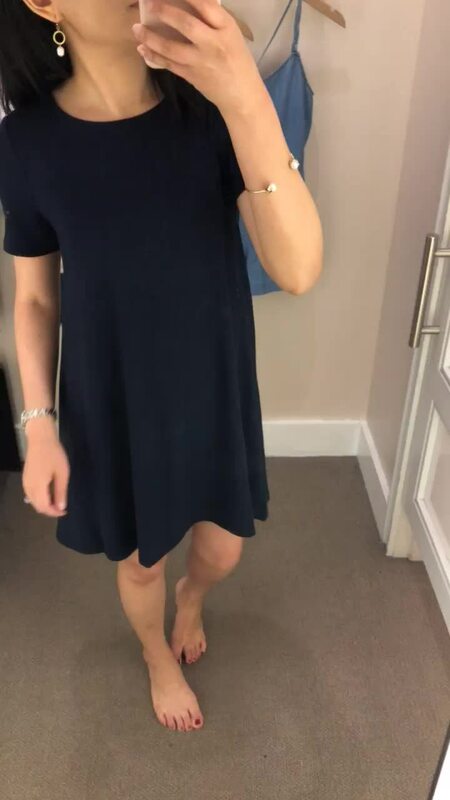 I love this soft, swingy dress. Size XS petite is true to size and measures: 31.5″ chest (measured pit to pit), 27″ waist, 33.5″ total length. This white ribbed trim open pocket cardigan is one of my favorite new purchases and I took my usual size XS petite. It’s the same style as the off white and black one I have from last year when I went with the regular missy sizes for an oversized fit (review here and here). I love the darker print of this skirt for the upcoming fall season. If you love this print it’s also available as top and dress. The skirt is shorter than I would prefer and the measurements for my usual size 0 petite are: 27″ waist, 34.5″ hips, 38″ along the bottom hem, 17″ front length and 17.5″ back length. 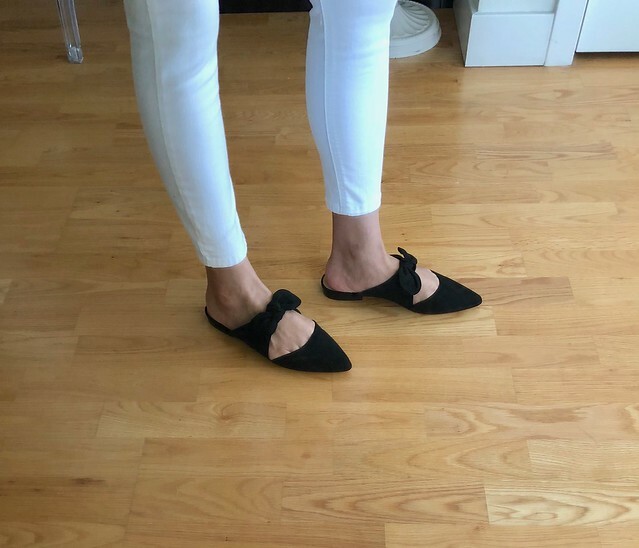 These bow mules are really cute but I couldn’t find any jeans I loved them with aside from my white ankle length jeans. They also come in pink. I’m usually size 7 and theseflats run true to size but if you want more space in the back then you can go up half a size. 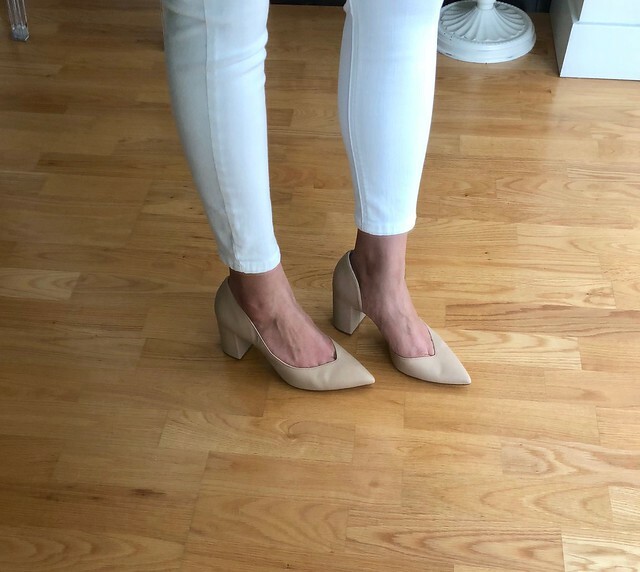 Please check out my previous Nordstrom Anniversary Sale reviews if you need help with sizing. I got this sweater in last week but the v-neck is too low and it’s a bit too boxy and short for my preference. I ended up returning it even though it was very soft and well-made. I had tried it with the layered lace cami which is how many other bloggers styled it but I didn’t love the look on me (as seen here). 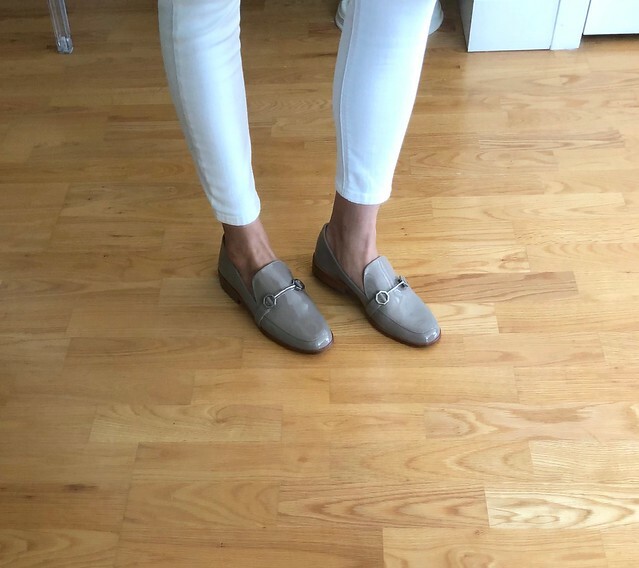 I was hoping that these neutral patent loafers would work out but they were too stiff for comfort in the back of the heels. They did run true to size. Apparently 1.STATE is a Vince Camuto brand but I only just realized that. These black heels are very comfortable and run true to size. The material is not soft but I was worried the leather would show creases over time. I felt that the block heel was too clunky from the back view. I also did not love the Cipria leather color against my skin tone so these pumps also went back. These Zella live in high waist crop leggings are so soft and the material is thinner than the full length version I originally ordered but returned (review here). This style offers a medium level of support and I felt slimmer when I put them on without them feeling restrictive like Spanx. The measurements for size XS are: 24″ waist (unstretched) and 20.5″ inseam. I’m 5′ 2.5″ and I have a 27″ waist and 33″ hips. I ordered a lot from the #nsale to try but so far these leggings are the only items I found worth keeping. Now I can understand what all the Zella legging hype is about! I still have two items that have yet to ship out since the beginning of the sale. 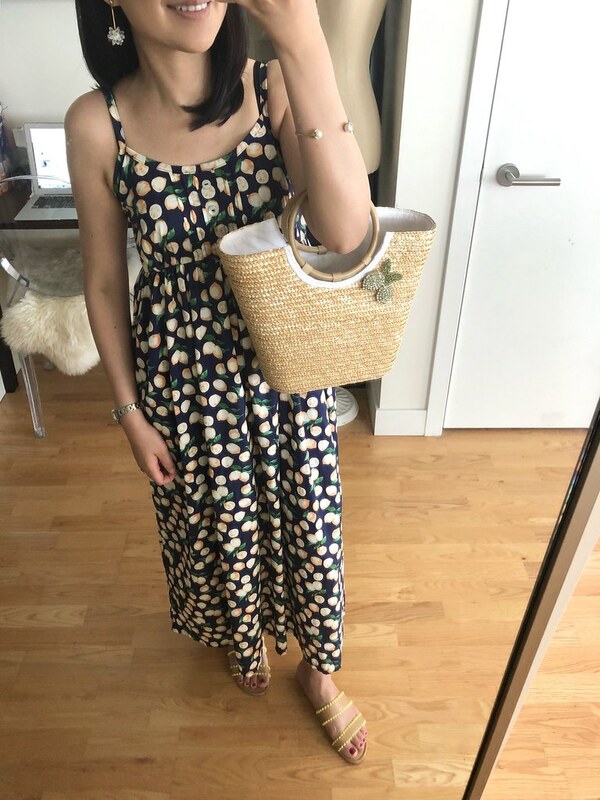 I thought the lemon print for this dress was too cute so I ordered it to try since it was free shipping and free returns via Amazon. The dress is made of cotton and unlined but due to the darker print it’s not see through. The straps are adjustable and the empire waist is elasticized but this dress is best for smaller busts ( I’m a 32A in petite bras). 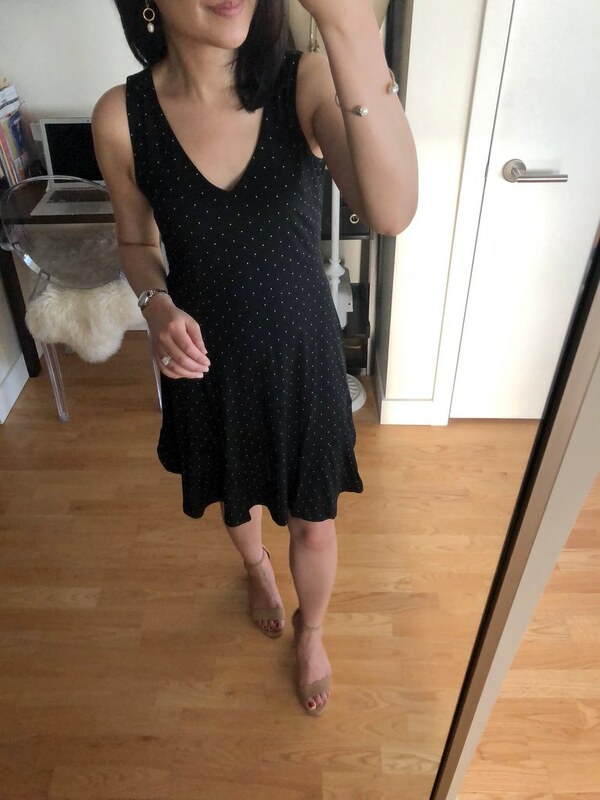 It has a junior size fit and it’s ankle length on me (I’m 5′ 2.5″) so this is a petite friendly length. The dress washed well in cold water and air dried. I wouldn’t put this dress in the dryer since it’s cotton and it will shrink. Update 8/17: I would not recommend this dress since it is unlined. I tried it on again today and I didn’t like how the material felt against my skin. There was a scratchy seam at the empire waist that bothered me. Ugh, I missed out on the striped sweater you returned! I’m stalking it online for a popback in XXS! Fingers crossed! I hope you can snag size XXS! It's so cute and perfect for the summer!